No event is complete without the valuable feedback from surveys filled by attendees. 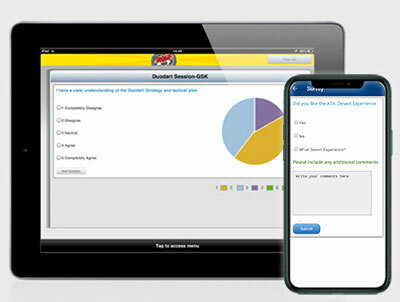 Create surveys from the content management system to distribute through the mobile event app. Set up as many questions as required, choose if they are single answer, multiple answer, or text answer questions. Download results instantly from the content management system onto an Excel sheet. Show your surveys in the survey section or attach them to sessions. Convenient for event administrators, attendees, and planet Earth. 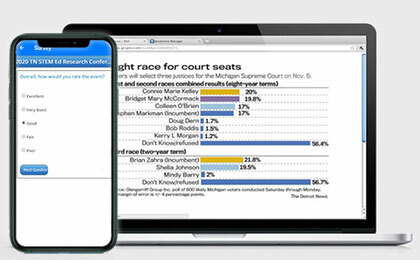 Create polls for your attendees to participate in as well, which can be sent to attendees through the event apps. As many polls can be created as required. Choose to attach these polls to session and exhibitor records or even have them appear in the surveys section. With the real time ability to change data in the apps you can publish these polls on a certain day of the the event and then take them out of the event apps in a few hours. You can also send push notifications to attendees to inform about a poll being made available for them to respond to.